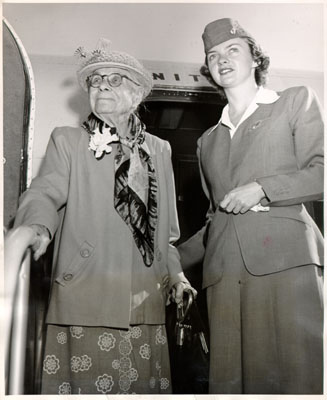 Alice Eastwood boarding plane for International Botanical Conference in 1950. 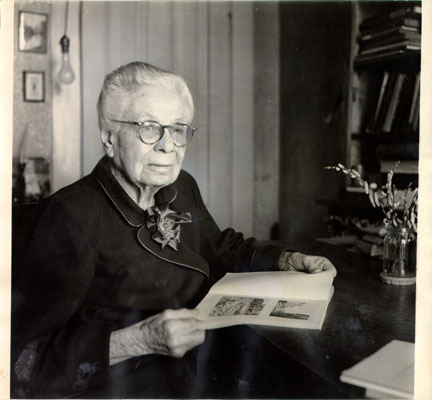 Alice Eastwood, the pioneering botanist who worked on the staff of the California Academy of Sciences for more than six decades, compiled a valuable record of San Francisco's native plants in the late 1890s. In 1945 she wrote the following essay about how San Francisco once looked. In the 1890s the open country everywhere around San Francisco was a beautiful wild flower garden in the spring. 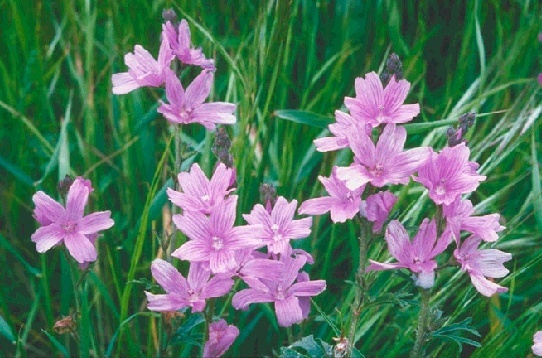 In the region near Lake Merced the wild flowers were so thick that it was impossible to avoid stepping on them. There were California poppies [Eschscholzia californica], nemophilas, violets, cream-cups [Platystemon californicus], owls-clover, mouse-ear chickweed [Cerastium glomeratum], Indian paintbrush, clovers, etc. The yellow violet, Viola pedunculata, was especially common, known to the children as Johnny-jump-up. Today, new roads, golf links, vegetable fields, and human habitations have driven them away and it is doubtful if a single native flower persists. A solitary madrone grew in a gulch leading to the lake, the sides of which were covered with dense chaparral. Ceanothus incanus [coast whitethorn] formed a thicket together with hazel [Corylus cornuta var. californica], manzanitas, low oaks, and other shrubs. Climbing over them was the Dutchman's pipe, Aristolochia californica. The Bay View Hills near South San Francisco was the home of some flowers not found elsewhere in the city. These were the climbing nemophila, Nemophila aurita [Pholistoma auritum var. 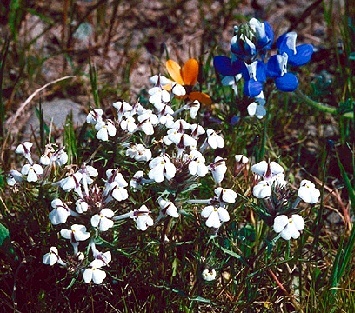 auritum, fiesta flower]; the white flax-flowered gilia, Linanthus liniflorus; islay cherry, Prunus ilicifolia; the tall larkspur, Delphinium californicum [D. c. ssp. californicum, coast or California larkspur]; the stinging phacelia, Phacelia malvaefolia. On the rocky summit, now known as Bay View Park, were rock cress, Arabis blepharophylla; the paintbrush, Castilleja foliolosa [aka woolly indian paintbrush]; pennyroyal, Monardella villosa [aka coyote-mint]; and later, several composites and eriogonums. In the meadow below was a garden similar to that at Lake Merced. In some places near Visitacion Valley the ground was white with pelican-flower, Orthocarpus versicolor [=Triphysaria eriantha ssp. rosea, butter-and-eggs or johnny-tuck], and in other places the areas were pink-tinged from owls-clover, Orthocarpus densiflorus [=Castilleja densiflorus]. These common names were given to these flowers by Dr. Kellogg, the latter because each flower formed the face of an owl. Everywhere golden poppies and amsinckias [fiddlenecks] glorified the landscape. On the hills back of Ingleside, then known as Sunset Heights, and on the hills rising from the Mission, a great many flowers could be found. The Potrero Hills, too, were then covered with flowers. The white Fritillaria liliacea [fragrant fritillary] grew there and in a wet place Miss Cannon discovered a long-lost species, Sanicula maritima [adobe sanicle]. At Hunters Point, now entirely covered by a housing project, this fritillaria was found a few years ago by Lewis S. Rose, and I found the fragrant Dodecatheon bernalinum [D. clevelandii, shooting stars] there in 1916. This was still on Bernal Heights a few years ago. Bright purple blooms from silver lupine, seen here on Twin Peaks in 2010. 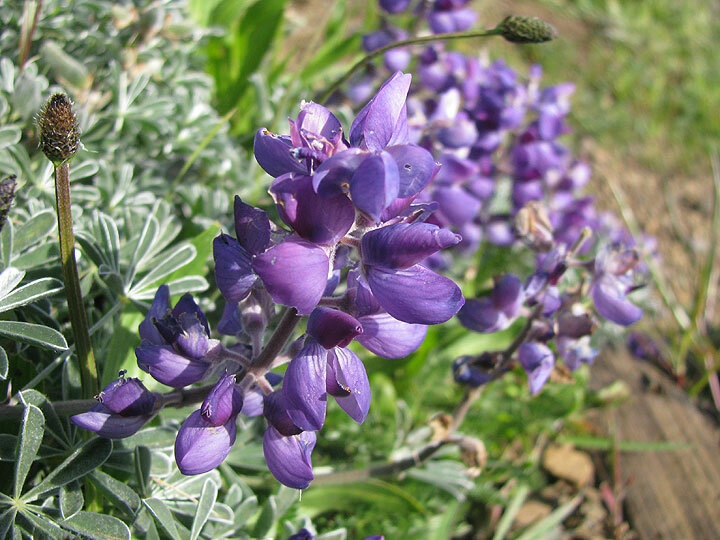 Twin Peaks still has the low blue-flowered lupine, Lupinus collinus [L. albifronis var. collinus, silvery lupine], a few clumps of Iris douglasiana and I. longipetala, but in the 1890s, the tiny yellow-flowered Baeria gracilis [=Lasthenia californica, gold fields] monopolized the ground in places and the golden slopes could be seen from the windows of the California Academy of Sciences on Market Street before the erection of the Emporium building. Some other relics of the 1890s may yet be on those hills. 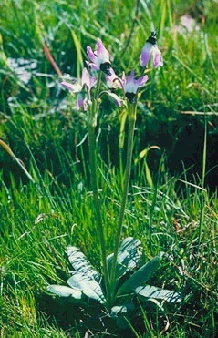 The Mission Bells [Fritillaria affinis] are occasionally found there, and other species, such as footsteps-of-spring, Sanicula arctopoides, other species of the Parsley family, the pink-flowered Sidalcea [S. malvaeflora, checker mallow or checker bloom], and, of course, buttercups, Ranunculus californicus, everywhere. The San Bruno Hills south of Visitacion Valley were noted for the great beds of Iris longipetala. Homes are replacing them now. Some plants are still left but unless a tract is preserved by some lover of this beautiful flower, soon all will be gone. Colma Canyon was a favorite haunt of the Botanical Club [formed in 1891 as the California Botanical Club]. The white sessile-flowered trillium grew there, besides columbine [Aquilegia formosa], meadow rue, fringe-cups (Tellima), California saxifrage, baby-blue-eyes (Nemophila insignis), cream cups (Platystemon), bleeding heart (Dicentra formosa), and the tiny white-flowered Meconella. In some places the sluggish creek was covered with the dainty water-fern, Azolla. On the adjacent hills, the hummingbird sage, Salvia spathacea, was common. These hills were clothed with native shrubs. Besides the oaks, hazel, and poison oak, there were manzanitas, shad-brush (Amelanchier), twin-berry (Lonicera ledebourii), ocean spray (Holodiscus), oso-berry (Osmaronia), the two thimble berries (Rubus parviflorus and R. spectabilis), blackberry vines, and other shrubs, but no ceanothus. These may still be there as it is a dairy ranch with no trespassers permitted. In the early 1890s, the Presidio was as beautiful a wild flower garden as Lake Merced but the pines, cypresses, and eucalyptus have destroyed most of the flowers and any that might have survived have probably been smothered by that fig-marigold, Mesembryanthemum. 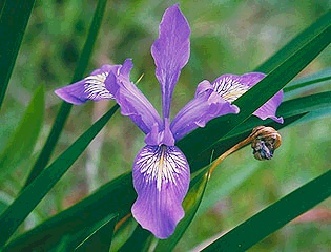 In olden times a low form of Zigadenus fremontii whitened the ground, the blue violet as well as the yellow was common, as were also two species of Orthocarpus not found in any other part of San Francisco; and a dark red onion and clumps of the blue Douglas iris loved rock ridges. Besides there were the flowers common elsewhere. However, the yellow-flowered bush lupine, the blue-flowered Chamisso lupine, and the broad clumps of Ceanothus thyrsiflorus still hold their own. Not long ago, Lewis S. Rose even added a species of the fern allies known as quillwort, Isoetes nuttallii. This had never before been found in the San Francisco area and is not a common plant. The wax myrtle too, may yet be growing along Lobos Creek or Mountain Lake. Botanist Alice Eastwood, April 21, 1953. Another attractive excursion was along the railroad track that once went to Sutro Heights via Lands End. 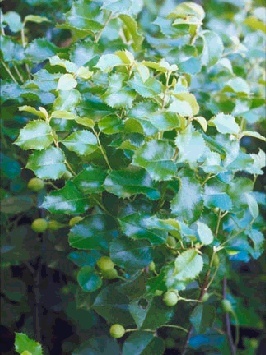 Except for the wild currant which was abundant in the spring, this area was better for summer and fall. The pink and yellow sand verbenas, the San Francisco willow-herb, Angelica hendersonii, cow-parsnip (Heracleum lanatum), golden rod, lizard leaf (Eriophyllum), Baccharis, and the heather-leaved Ericameria, all were common. The sands, forming dunes in many places, are still extensive as always, though they too are being replaced by rows and rows of homes. However, the franserias, artemisias, seaside daisies, beach morning glory, cakile, wallflower, gilias, eriogonums, castilleja, and many other less conspicuous are still to be found. A survey of these and other unoccupied areas in San Francisco may discover many unsuspected relicts. Open spots amid the trees in Sutro Woods back of the University of California Hospital may shelter some and on the upper slopes of Mt. Davidson a few may still persist. Eastwood, Alice. 1945. The Wild Flower Gardens of San Francisco in the 1890s. Leaflets of Western Botany 4:153-156. Howell, John Thomas, Peter H. Raven, and Peter Rubtzoff. 1958. A Flora of San Francisco, California. Wasmann Journal of Biology 16:1-157.